There are foods that, when eaten, activate the same part of the human brain that heroin does. Food scientists have developed our edibles to have “bliss points”. Arguably, the obesity epidemic may not only be about personal willpower, but also about processed foods being highly addictive. Pulitzer Prize-winner Michael Moss examines the development and advertisement of processed foods in his bestseller Salt, Sugar, Fat: How the Food Giants Hooked Us. Narrated by the straightforward – and sometimes incredulous – Scott Brick, the audiobook is a phenomenal read. 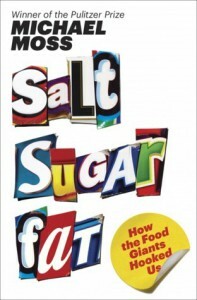 If you liked The Omnivore’s Dilemma, Food, Inc., or Fast Food Nation, definitely give Salt, Sugar, Fat a try.